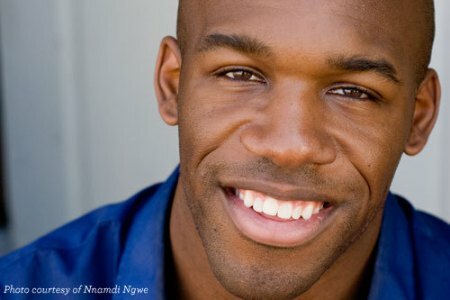 Nnamdi Ngwe is an actor, model, Improvisor, teacher, and writer. He studied and teaches at iO Theater and The Second City. Nnamdi was recently awarded teacher of the year at iO Theater. With is twin brother and writing partner, Amechi, Nnamdi wrote and starred in the critically acclaimed show Julius which earned him a trip to the New York Television Festival and a nomination for Best Screenplay at the Best Of The Midwest Film Awards among others. He also wrote and starred in Rap Skool, which was also screened at the New York Television festival and earned him a best actor nomination at the Best of the Midwest Film Awards. Nnamdi also wrote Oak Ridge Patrol which was accepted into the New York Television Festival. Along with the rest of the cast of 3Peat, Nnamdi co-wrote and starred in The Blackening on Comedy Central. He can be seen as a cast member in You’ve Been Had Celebrity Edition and can also be seen in sketches for The Ringer. Check out the gallery and video sections for more on these! Fun Fact: Nnamdi played soccer at the University of Alabama at Birmingham with his twin brother, Amechi Ngwe.